I was perusing The Girl Who Ate Everything, and I came across something called a blueberry croissant puff. 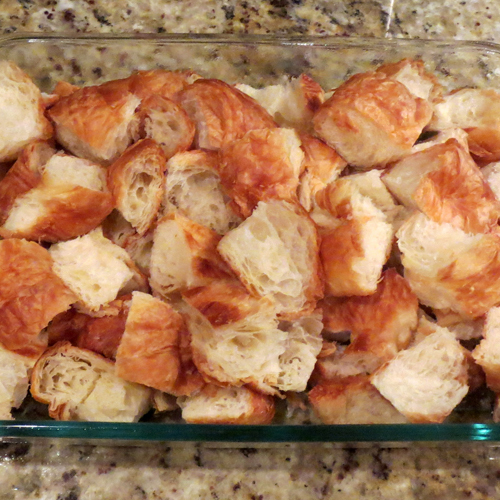 I was immediately intrigued at the idea of a french-toast type bake using croissants instead of bread. 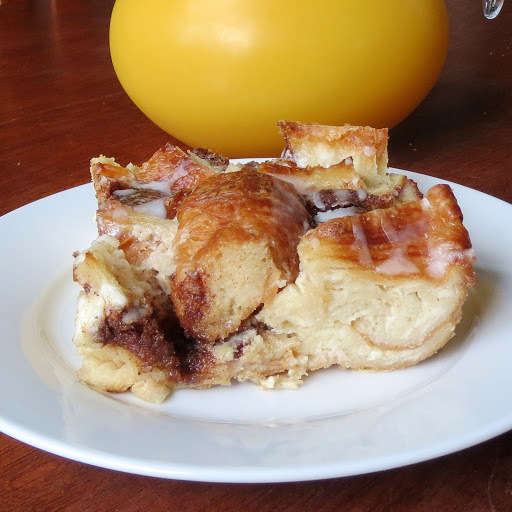 After reading the recipe, I decided that I wanted to skip the blueberries and do a cinnamon roll filling instead. 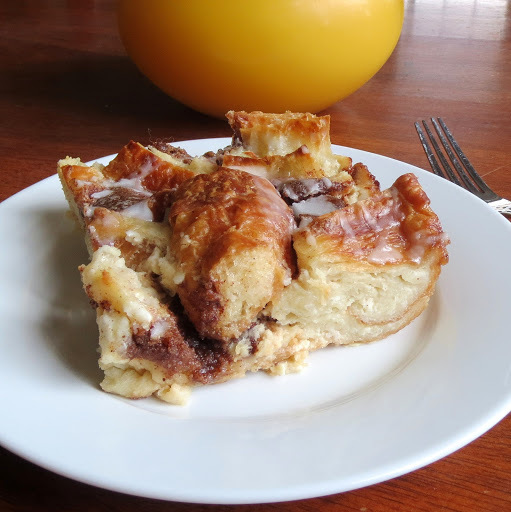 This recipe has buttery croissants, dolloped with buttery cinnamon roll filling, soaked in a cream cheese custard, and then topped with a drizzle of icing. Oh. Em. Gee. 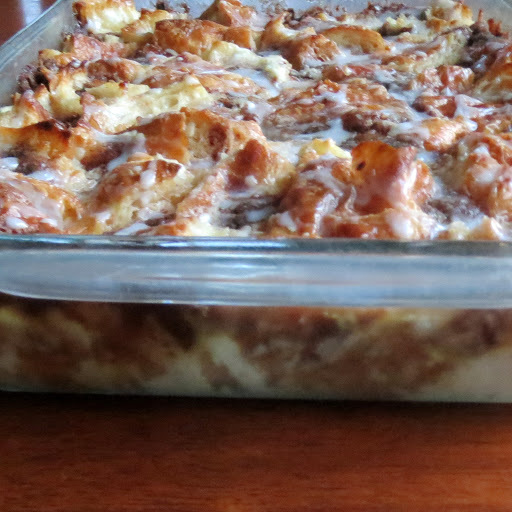 If you like cinnamon rolls, and you like bread pudding, and you like EASY, then this recipe is for you. It would be a perfect Christmas morning breakfast, too. 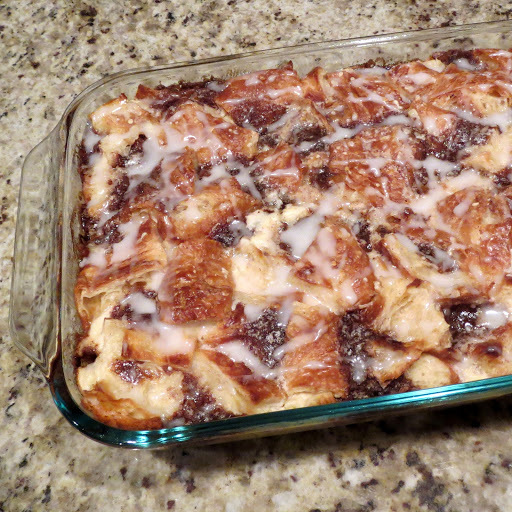 This would not be a good make-ahead recipe, however- you want to make it the morning of for it to turn out best. Luckily, it takes like 10 minutes to throw together. I, of course, sent it in to my husband’s work. I made it at 11pm last night, so I didn’t get a chance to take photos that would really do it justice before my hubby whisked it away to work, but you get the picture. 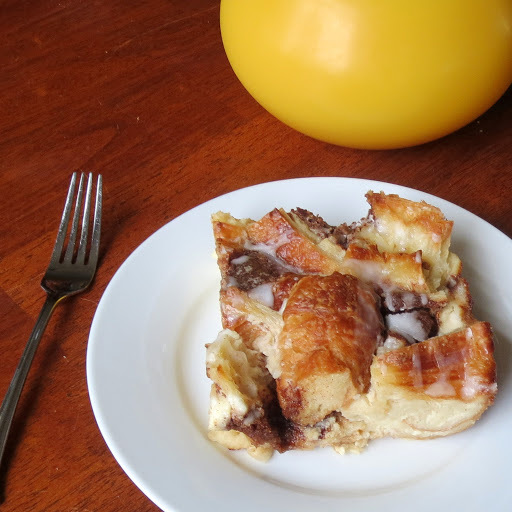 You can halve this recipe and make it in an 8×8 pan if you have a smaller crowd. 1/2 cup of powdered sugar plus 1-2 tablespoons milk or cream until desired drizzling consistency. Preheat the oven to 350°, Lightly grease a 9×13 baking dish. Spread cut up croissants over the bottom of the dish. In a mixer, beat the cream cheese and sugar until smooth. Add eggs one at a time, beating after each addition. Slowly add milk and vanilla. Mix together cinnamon/butter mixture and place in dollops over the top of the croissants, making sure to incorporate it under all layers. Pour cream cheese mixture over the top. Press down with your clean hands and make sure all croissants are covered with the mixture. 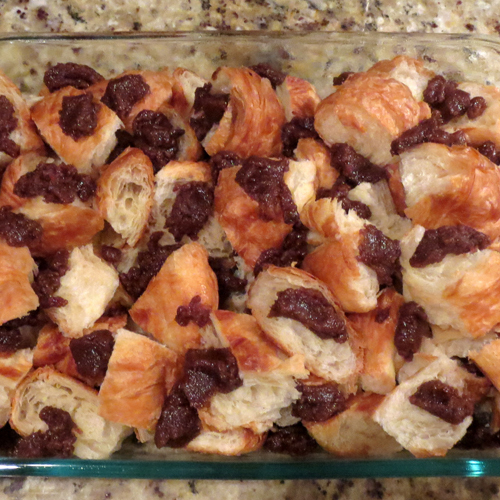 Bake at 350° for about 30 minutes, until top is brown and the center is set. Drizzle with the powdered sugar drizzle mixture. Let cool for a bit and then serve warm. 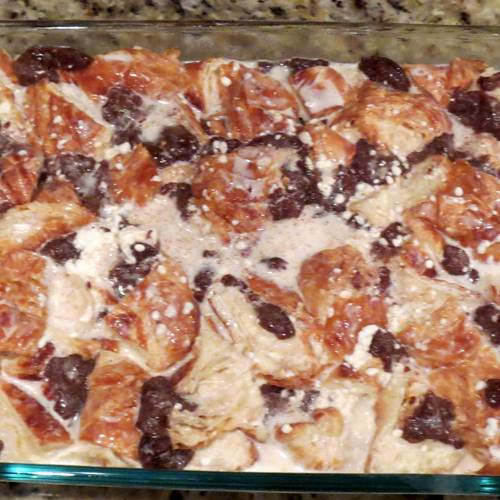 I made this for Christmas this past year, and have it in the oven right now for Easter brunch. This recipe is so good! Tastes just like Cinnabon! The only change I made at Christmas was to use heavy cream instead of milk (because we had gone through it all). Decadent! !